My marathon was great (sarcasm off). How about you? We have always talked about weekends, marathons, FL, new content and similar patches effecting the gameplay. Whatever the reason the result always seems to be the same: playing becomes quite awful. And despite it is reasonable to believe that everything applies to both teams sometimes it does not work that way. 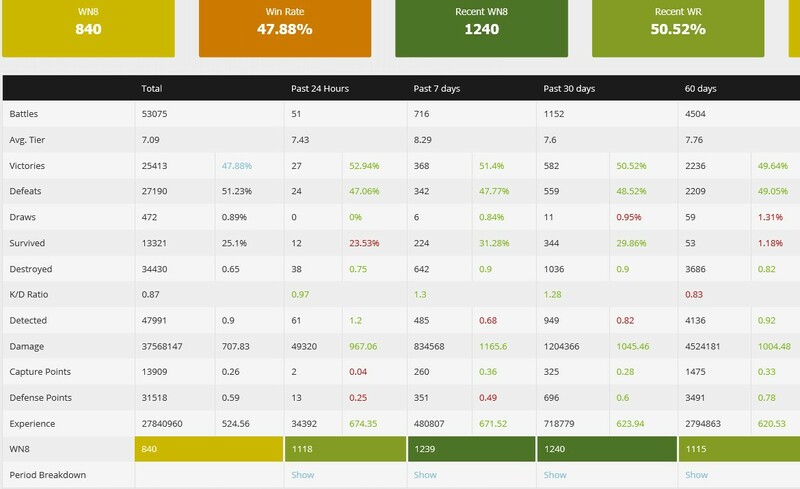 Great players can maintain their results, but across the spectrum it is just a huge degradation; battles become roflstopms, by the time you get to a position to do something 2 EBR-s are already dead, flanks abandoned, foch and t50 start shooting each other, one becomes blue and gets killed by third so you are 2 tanks down before you see the enemy ... You know, that sorts of things. Anyhow, many of players I have played with during the course of the marathon felt the same - atrocious. Lots of those games I platooned with a 57%-er (cheers Buelo) in T9 tanks that are capable of carrying and I am solid in, and we did a good job under the circumstances. TS5 is in my garage, so taking a beating wasn’t for nothing. So, without a thin foil hats I post how lovely it was for me - first I was "noooooo way", then disbelieving, slight despair and eventually I got numb. It was so ferocious that my recents (1k games) dropped from 58% to 52%. You are free to share your experience. I would especially like to see the positives, add some salt to my wounds. TLDR: I got the TS5 but since nothing in life is for free now I cry. It was great. Didn't play nearly enough to get the tank, but free stuff with no extra effort is always welcome. Hey, at least ur WN8 is improving. Mine has been dropping down like an old man's jewels. Edited by scratch910, 15 April 2019 - 09:19 AM. Terrible teams. WR down. Got to level 9 of discount for the credit boosters and decided not to pay the 5.5EUR for the tank. Quite proud of myself. I didn't get the TS-5. I wasn't even trying as I have no interest in non-turreted TD's. I played only 58 games, but got to mission 6 so I got some free rewards. Was a pleasant experience for me. My marathon went really well. 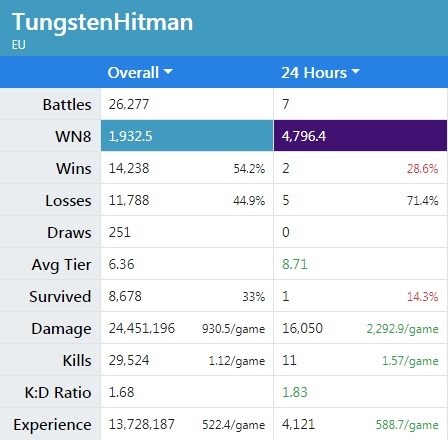 Didn't play a single round of WoT as the event was on. I got the TS-5 on Saturday night. Certainly didn't have the issues you seem to have experienced, though it depended what vehicles I tried to play. Anytime I tried to play lights when the spotting missions were active on some of the daily missions, I'd find myself on a team with 5-8 other lights, many of which would yolo in. Edited by WoT_RU_Doing, 15 April 2019 - 09:59 AM. As said, good players manage to do it, as you have. I dont know how, cause I lost for instance 3 games in a row, fighting in front, doing 3.9k, 2.8k and then 3,2k consecutively in Patton 46 and not even close to be enough. Yeah, it is not enough to carry, but with games like those it usually works for 55% wr in my case. Then, next couple of games I get bottom tier without any time to do something significant cause team just crumbles, you put some shots in, retreat to manage 1 more and then its all over. Edited by Bora_BOOM, 15 April 2019 - 10:03 AM. 37% win rate? Wow, lucky you, try 28%.... But then again I'm obviously terrible and a burden to all teams. So... if I played badly would be what? 0% win rate? That was just for Saturday actually, was just grinding that X5 for the B-C, unlocked and bought the Pantera, I think the hint, the game decided I shouldn't play for the rest of the weekend and so I didn't and I was very nice and relaxed chilling with my family yesterday watching The Hangover 2. As far the marathon went, well I can't complain it went pretty good actually all crayons considered. I just kept my focus on the mission requirements so win lose or draw I wasn't getting salty as much as normal for idiotic teams melting in seconds. There was plenty of "do X amount of damage" which were really easy, I just picked tanks that could do that with 1 shot which was surely possible even with the worst team and RNG giving me middle fingers throughout in fact if I was not a team player I could have just taken 1 shot, purposefully died to get back to the garage quickly and rinse and repeat to a very very fast set of damage mission stages. The marathon stages that could have been really nasty were the "do X amount of base xp" whereby if it was just mostly losses would have been really grindy and annoyed me but I was very lucky for those and was something like 65-70%+ win rate I couldn't have hoped for that good all things considered. 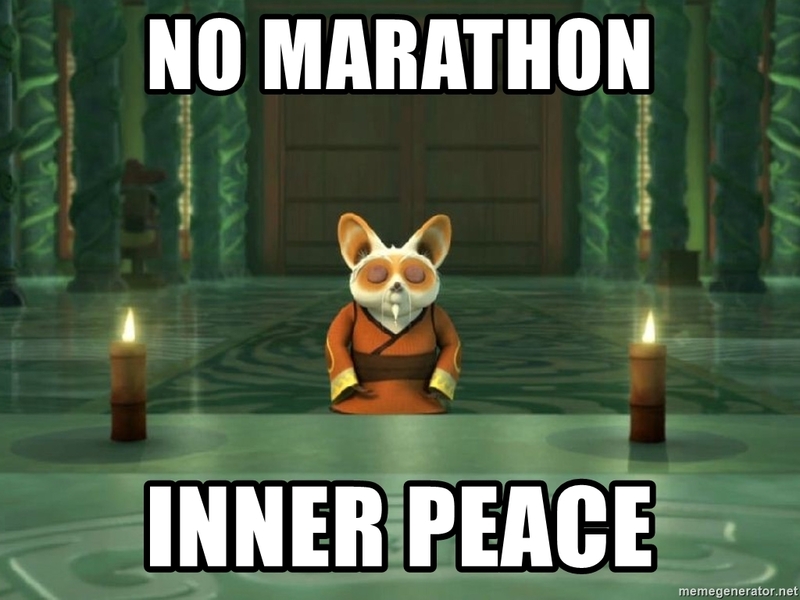 So I completed the marathon fairly quickly all things considered and it was pretty enjoyable. The last few days I was playing I was just grinding crew and 2 lines which was mostly losses and not so much fun so I stopped. That T8 Czech VTU medium tank.... I mean, I can say fine, the tank is not good at T8 and I was a burden to the teams who had me compared to someone with a Progetto or Lorraine etc but 0% wins in 7 battles with it? really?? There was 14 other players with awesome and higher tier tanks on the battle, 0%? and they were steam rolls I never actually got a X5 with that tank and I just gave up on it, opened a fresh box of crayons, and went and watched TV instead and was much the happier. It was alright. Took half the time required to get the EBR and I don't think my stats "suffered" during it. That is nasty. I had two sessions last week, one was 6 wins out of 17, the other was 3 out of 13 with 9 straight losses, so a 37% looks like a bloody lottery win. Edited by Bora_BOOM, 15 April 2019 - 10:09 AM. Lost interest in marathons a long time ago. Too much like work rather than a hobby. My sessions evened out thankfully... I had some awful spells where the teams so so bad, literally half of the players I wouldn't trust them to tie their own shoe laces Then I had runs where I won like 9 games in a row, the bad players on the enemy team. It seemed very bad at t9 for me, noobs who can't play but think they can use the fast track to complete the maration, just so sad that they are that deluded. In hindsight the marathon was probably to easy, the 500 dmg missions in particular a big noob magnet. Fools pressing battle then doing the dmg then yoloing as they just want to scrape the mission requirements. I still can't "get" what players that have 10K + games and literally land 1-2 shots get from this game ( and there are so many of them ), I would be just be so bored I would just play something else.... tetris and barbie seem popular suggestions. The only reward tank that I ever played to get was the Valentine II and I completed that in the Valentine II. 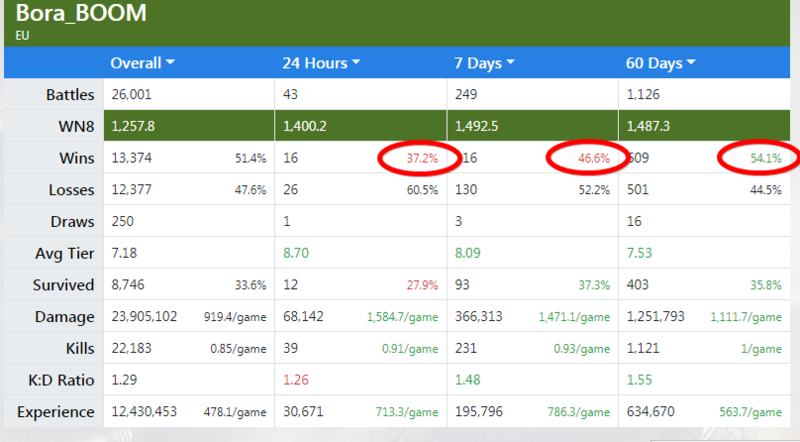 57.71% over 300 games. Totally normal. Edited by BR33K1_PAWAH, 15 April 2019 - 10:47 AM.